Event Description: An entertaining site for a corporate team building event, Downtown Princeton — perched gracefully to the north of its famous university namesake — is a delightful attraction in and of itself. 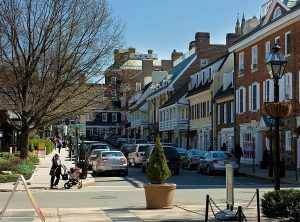 From elegant Palmer Square, with its historic Nassau Inn of 1756, to the myriad shops, boutiques, restaurants, and art galleries all around, Princeton is not only a charming town to visit, it’s also a fantastic place for a treasure hunt. During your corporate team building treasure hunt…expect to visit the cemetery where Aaron Burr and Grover Cleveland are buried; walk the walk of stars; explore a wall of mysterious objects; salute the veterans of four foreign wars, and much more. Princeton is the home of mathematician John Nash, so you better bring your “Beautiful Mind” on this hunt! Gather in Downtown Princeton, on Nassau Street, opposite South Tulane.